As I get older, my tolerance for country music has gone up, to the point where I think I might actually be a bit of a fan. I'm not even ashamed of it. Make no mistake - if I lived in America I'd wear the cowboy boots with a skirt and drive a pick up and listen to country music all the time and I'd probably say ya'll even though everybody in the vicinity would wince at the inauthenticity of it. Sadly in this country I just can't get away with any of that, except maybe wearing my ancient red boots under trousers in the winter. Still, it doesn't stop me watching (and loving) Nashville and listening to country music stations whilst on holiday, and in lessons with my long-suffering GCSE classes, with whom I study the American West. "It's relevant and will help you to have a better understanding of the topic," I lie, convincingly, when they complain. It's not really a lie - I do believe it is helpful in better understanding how America has developed from its origins - but the chances are, the subtleties are lost on your average 15 year old. Nevermind. I enjoy it. Maybe a little ironically, but I don't think the artists will care about the ironic cents in their royalty cheques. Here is a round up of some of our favourite country songs from this holiday. Having bought the necessary cable, we spent most of our trip listening to 80s Groove on my iPod, but once we hit the Californian coast and there was regular radio signal, I tried to ensure it was wall-to-wall country for the rest of the road. Chew-the-bacca, chew-the-bacca, chew-the-bacca SPIT. A lovely image. "I'm gassing up the Chevy" became one of my most-quoted lines during the trip. This made us laugh the most. Between this and Before He Cheats, I am starting to wonder whether Carrie Underwood has suffered a lot of cheating in her life. Have to say that this feels like subliminal messaging. "Here is my ideal woman: I will suggest that this is a typical southern women and thus influence a generation to behave in the way I think is correct." Catchy, though. These next two are a bit weepy. I thought this was about a lost wife before I saw the video; it didn't make a lot of sense though because the truck sounded pretty beaten up and grubby for what country music would have you believe is a typical country girl's truck. Now I realise it's about an army buddy (dur) I might like it a bit less. Mods: I was concerned the cuff might be too small so I increased two stitches after turning the heel. I had intended to increase more but then changed my mind. This worked out really well because when it came to the final rows of ribbing, I had the right number of stitches to work it as set. I think I was meant to work 18 rows of the ribbing at the end, but I did ten and then bound off. LOVE. 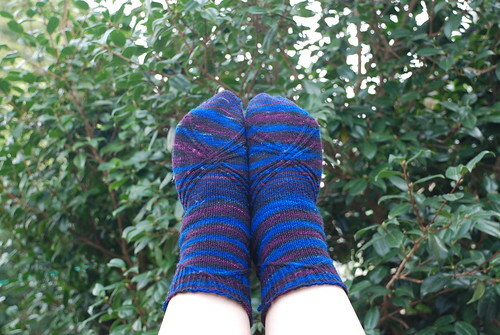 I love the colours in the yarn and the cabling and the bow at the back, like I am wearing ballet shoes, not socks. They were cast on at knitting group in July and knitted mostly on holiday. I got them out on the plane over and realised I had forgotten my cable needle. I am not good at doing cables without a needle, so I improvised, first from a piece of lolly stick and then with a cotton bud with the ends snipped off. Both worked reasonably well, but I think the squareness of my piece of lolly stick distorted the cable a little on one side, which is why I switched to the smooth, round plastic. This used 88g of yarn. Towards the end of knitting I was quite concerned about what was happening because there was so much yarn left over, until I weighed it and realised this skein was around 160g. Of course, I have lost the tag (I know I saw it SOMEwhere recently but....meh) so I guess it was a special skein of some kind. I think the colours are like bruises. The skein had to come home with me when I saw it - I love the blue especially (of course). Officially the biggest size was too small for my enormous feet. I think the biggest size around was 7 inches and mine measured at something like 10. I went for it anyway and they fit just fine. They are maybe a little on the snug side so if I was to make them again, I would knit a few rows before starting the cabling. I'd also wash them before taking pictures, or at least brush off all the bits of fluff they picked up from my next project. Mods: I made it bigger. Even the biggest size offered by the pattern would not have been big enough for me (let us not forget that inspiring editorial when Vogue explained they didn't make all their patterns available in bigger sizes because "they know what looks best on bigger women" *eyeroll*) so I added 10% to the stitch count on the two back panels and prepared myself to knit a third panel for the centre if it still wasn't big enough, but it was. I also knitted it about 4 rows shorter, because I was afraid I would run out of yarn. I probably didn't need to do this and if I wasn't quite so lazy I would unpick my lovely i-cord bind off and lengthen it a little, but it's OK as it is. Hur hur. Mr Z caught me unawares with this one, but it made us laugh. This top had a very interesting construction. As you can see from my post about it here, you start by knitting the front portion in a spiral from the centre out, and then fill in the gaps through a combination of picking up and knitting down, and knitting panels. At least twice I was convinced the instructions must be wrong because it was completely counter-intuitive but, no, it worked. I even managed to crochet the elastic in at the back, although this was time consuming and made my hands hurt. I didn't crochet around the front edge as I couldn't really appreciate what this would add and, yknow, crochet is a Dark Art and I didn't want to do too much of it. And I wasn't sure if I had enough yarn left. 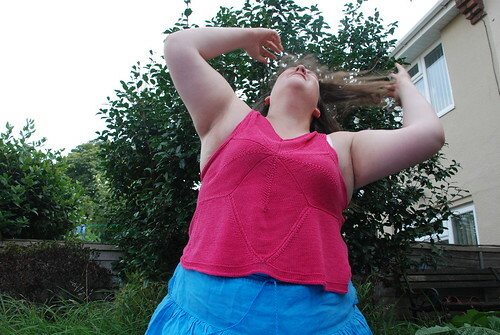 When I was looking at FOs on Ravelry I really wanted a close up of the underarm part, because that was the bit I struggled with the most - I was unclear about how to stitch the straps to their opposite panel and I felt the instructions weren't particularly enlightening. 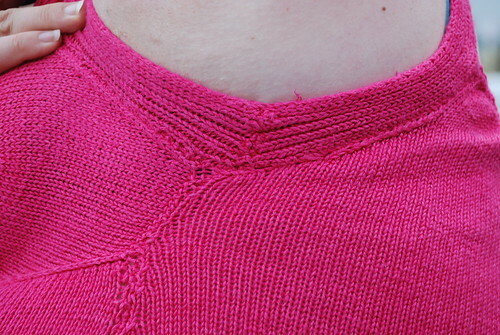 So, here is my close up of that part, just in case there are any other knitters in the same boat. I didn't quite get it right - the two underarm pieces are supposed to join above the side seam, but because I misunderstood the instruction when I was knitting the little extension panels, they joined in a different place to what I expected. I thought they'd sit on top of one another, to create a continuous line, but they sat against each other to form a point. The yarn is lovely. It was like knitting with twine to begin with, of course, but it softened up considerably just in the handling and now it has been washed twice (in the machine) it is even softer. The colour has remained true, too. It's quite heavy off, but really comfortable to wear and especially good when it's hot. The cone was 400g and I had a bit left over; Texere are quite vague with how much yardage 400g actually equates to, saying that it varies according to the colourway. 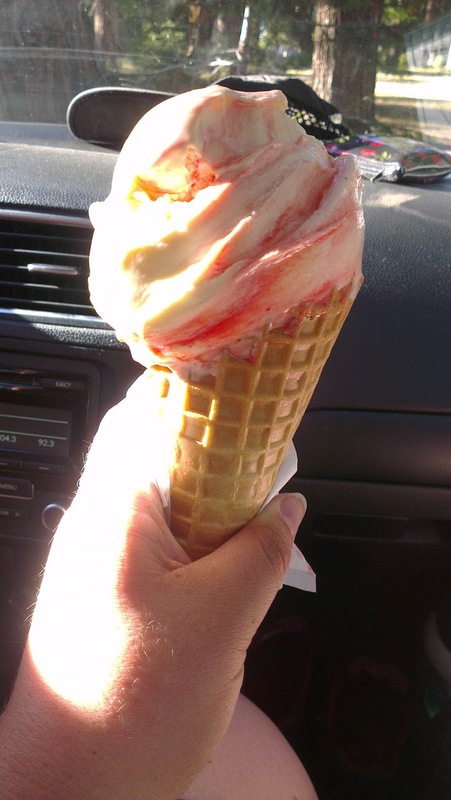 There is no doubt, though, that two cones would easily make a blousy plus-sized summer top with sleeves, which makes it an extreme bargain in my book, particularly since they're currently offering 4 cones for £24. I picked up a set of 2.25mm Karbonz with 100cm cable at Wonderwool in April, and was excited to get started on my summer holiday socks. The needles are a real pleasure to knit with - warm and comfortable with a nice sharp tip. The cable is flexible and not as stiff as the purple cables on the other KnitPro needles. The join is smooth, both between the needle and the cable and the needle and its tip. In fact, with the latter I was left wondering, "Is there a join?" I had nothing but good things to say about them. When I went to Jimmy Beans I picked up a 2.75mm needle to do the ankle portion of my socks, which I was afraid would be too small. I also picked up 4mm and 4.5mm tips but I reluctantly put them back because they were quite expensive. Now I am really pleased I did, because upon switching to the 2.75mm I realised that they are shockingly blunt. They are so bad that I have seriously considered, since I got home, switching to my 2.75mm Clover bamboo DPNs for the end of the sock, because it's a twisted rib and ktbl is excruciating with the Karbonz - I end up sticking the needle in the front of the stitch and swishing it over to the back because it's so hard to get the tip through the back loop (and it's not that I'm knitting tight - I can do it just fine with the Clover needle I'm using for the cables). I'm too worried about a change in gauge to change needles two inches before the end of the sock, but my progress has slowed because it's just not enjoyable to knit. 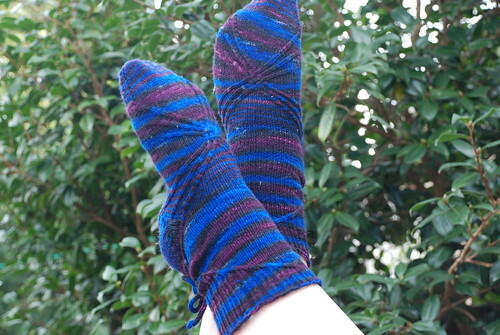 What a shame - they are so comfortable to knit with, but the tips just need to be sharper. From the top: Silver Creek, Summit Lake North (Lassen), Prairie Creek in Redwoods NP, Gualala River Redwoods, Calico. For some reason I have no picture of the DL Bliss ground; I must have taken it on the big camera instead of my phone. Prairie Creek. Big and clean, with hot water and soap in the toilets and electric lights. Surprisingly unbusy. Nasty hair clog in the drain but you can't have everything. At least I could adjust the temperature of the water, unlike at DL Bliss, where the handles had been removed. Summit Lake and Silver Creek didn't have showers and we didn't use the showers at Gualala River or Calico. 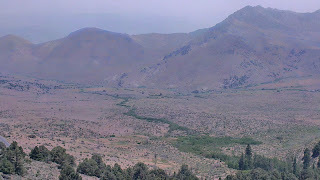 Lassen. Loads of downed trees and no rules about gathering. Mr Z picked up his walking stick here, which he spent the rest of the trip honing. Silver Creek. Newest, I'd guess - it had a shelf in it so it was double layered. Bear boxes are a godsend for those of us travelling with the kitchen sink - mostly helpful for storing all our stuff while we drive around Doing Things, as well as keeping away bears. The worst was at Prairie Creek, because although it had a door at each end, they both stuck and made a horrendous noise opening and closing, and the whole thing was at an angle so the doors would swing shut on us every time we were putting away/getting out things. Silver Creek, again. A good solid grill for putting over the fire, which is always appreciated. Calico and Gualala River didn't have grills; Prairie Creek and DL Bliss both had rather wide-spaced grills attached by chains, which are difficult to manouevre when they're hot. Probably DL Bliss. There was a good hill nearby and lots of rocks for clambering over. Lassen was also excellent though - we walked all the way around Summit Lake on our second morning and some way up the hill, before fears of poison oak/bear activity sent us back down again. Silver Creek was friendliest. Prairie Creek was the most efficient - there were two pairs. 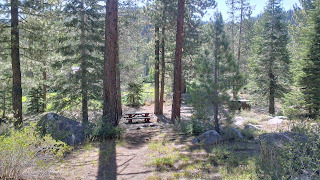 We didn't see the hosts at Lassen or DL Bliss and had only the briefest encounter with those at Calico and Gualala River. Lassen was the coldest - thermals and I was still cold. Prairie Creek was perpetually damp - everything we owned was damp by the end, including my knitting pattern, just from being outside. Gualala River was similarly damp; Calico was really hot - we slept with no fly sheet and no sleeping bags. That just leaves DL Bliss and Silver Creek. 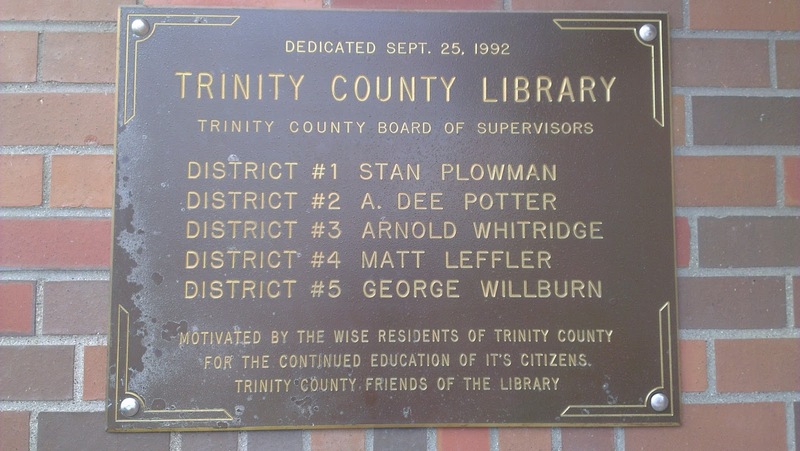 I guess the former has the edge because it wasn't quite so dusty. The ground was pretty uncomfortable though. I think Silver Creek probably wins the most comfortable ground award. 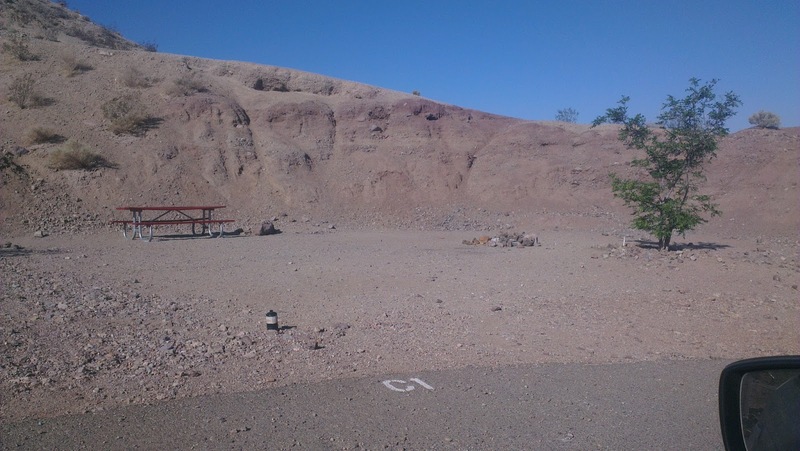 Calico has to win because there was only us and 2 RVs on a 295 pitch site. I don't know that I'd recommend it, though. 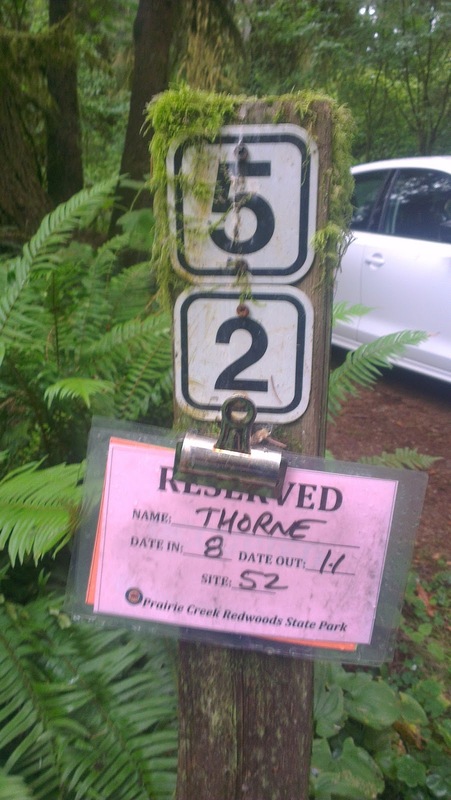 Prairie Creek was crowded - it books up months in advance, apparently, so I was really lucky to get a spot - and full of families but the dense undergrowth ensures privacy and dulls the sound somewhat. 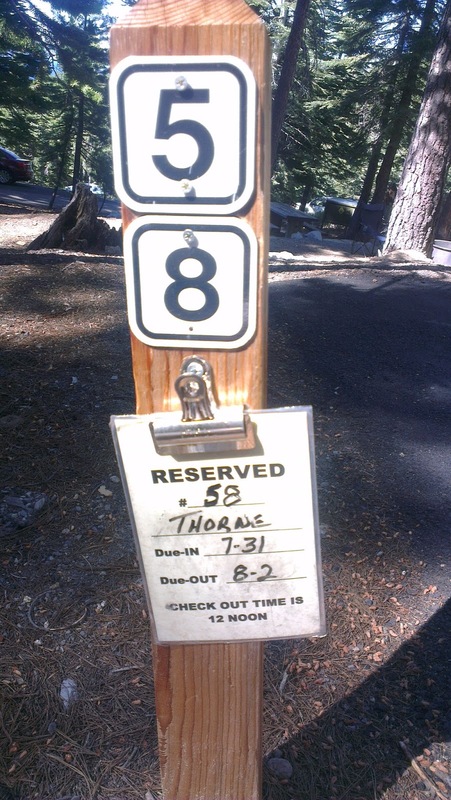 The Silver Creek and DL Bliss sites were quite private too. Gualala River should have been but a very large party of Mormons and their fridge freezer (I kid you not) were holidaying there so we were awoken by a screaming baby and then again by a small child running down the road screaming "CATCH ME!" None of these campgrounds had an open shop (we were excited when we read that the Gualala River camp store offered free coffee until 10am for its guests but it remained resolutely closed for our entire stay); we were quite good at taking everything we needed with us each time, which was especially important at Lassen, which was probably the most remote. I wouldn't go back to Calico - too hot, too uncomfortable - but any of the others might get a return visit from me. ..of the yarn variety, naturally. I spent about three hours hanging around Jimmy Beans in Reno. The new place (not that new, but different to when I last visited in 2009) is mostly warehouse with a small amount of stock in the shop at the front. This was GREAT for rummaging because (a) the yarn is all in boxes so I didn't get distracted by pretty colours in yarns I wasn't looking for and (b) there are no prices on the boxes so I wasn't constrained by concerns about the cost. I was very lucky so get some extra work in July which was extremely lucrative, so I was able to rummage at will. I also made a very restrained order from Knitpicks. I went out with a wishlist which I intended to fill between Jimmy Beans and Knitpicks and I actually didn't get everything on it, though I did pick up a couple of things not on it, so it evens out really. Dream in Color (sic) Smooshy in Pansy Golightly. I couldn't resist the colour which is more mauve than it appears in the picture. After this we went to Lassen which was all grey stone and wild lupins, so this yarn will always remind me of that. I have enough to make a complex, cabled cardigan if I so choose. Artyarns Ensemble Glitter Light. An extreme splurge. Actually, I wanted a few skeins of the beaded silk but they only had one in stock and I was very lucky to get that because the website said it was completely out of stock, and when they rang it up they put it through as a different colourway so it must have been at the bottom of the box. This yarn matches that, and I have a plan in mind for it. Koigu Painter's Palette Premium Merino. Didn't intend to buy this, but I like the colours. They had an extreme bright pink which I nearly picked up but I want to see how this knits up first. Knitpicks Palette. 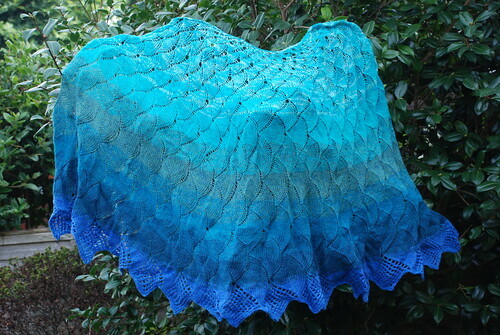 This is another shawl kit. The last one might have taken me three years but I love the FO so I thought I'd have another go - and it was in the sale. Madelinetosh Tosh DK in Cloud/Surf. On my list, but I wanted a little more; however, this colour couldn't be left behind and so I bought all they had. It's apparently a limited edition. 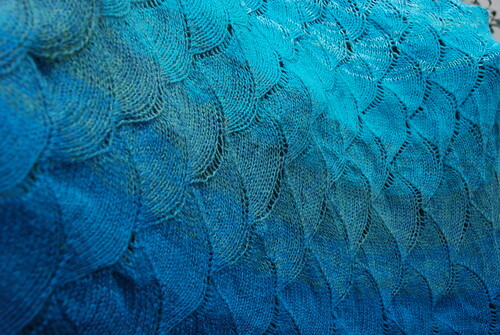 Artyarns Silk Splash Light in turquoise with silver. I could just keep this yarn in my bag and pet it, and coo over it, all day, every day. 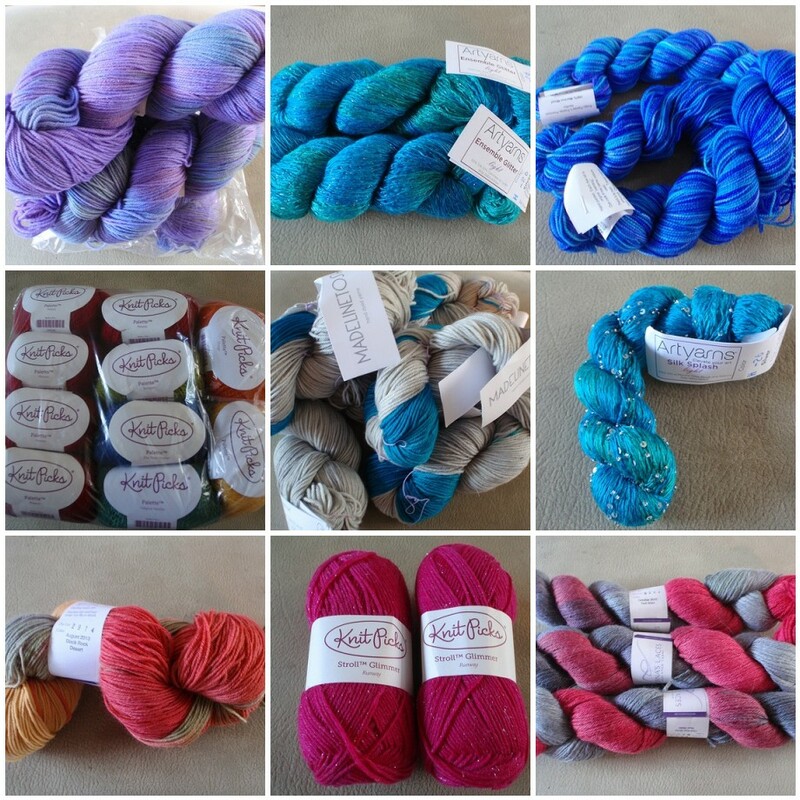 I don't know what I would have done if I'd been able to buy several skeins, because I would never have been able to find a project worthy of it. Lorna's Laces Sock Yarn in Black Rock Desert. This is the limited edition colour for August. I like it a lot and in this yarn it's quite faded, which I think is a perfect reflection of the desert. Father Hand spent some time in the Black Rock Desert before he moved to the US so this will make me think of him. 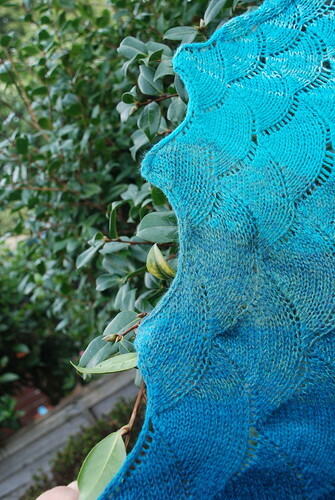 Knitpicks Stroll Glimmer in Runway. Sparkly, bright pink sock yarn in the sale? Yes, please, I'll take two. Lorna's Laces Honor (sic) in Red State. This was the limited edition colour last autumn; I bought some Blue State in Lion & Lamb and None of the Above in Shepherd Worsted, but this colour really sings in the Honor. It's quite subtle and washed out and the black is almost purple. I bought three but I can't really remember why; I think I might have been thinking of knitting another shrug. But I might buy another skein when I get my Beans Bucks next quarter. In fact, I think pretty much mostly all you hear is, "It might rain later." Having never been camping in Britain as an adult, I am speculating of course, but after chasing a cockroach the size of a Shetland out of the restroom just now so I could clean my teeth, I have to admit, I think it is time to be at home, where the main hazard, other than the weather, is a bad cup of tea. Not that I am complaining about our amazing summer holiday, of course. It has been awesome. 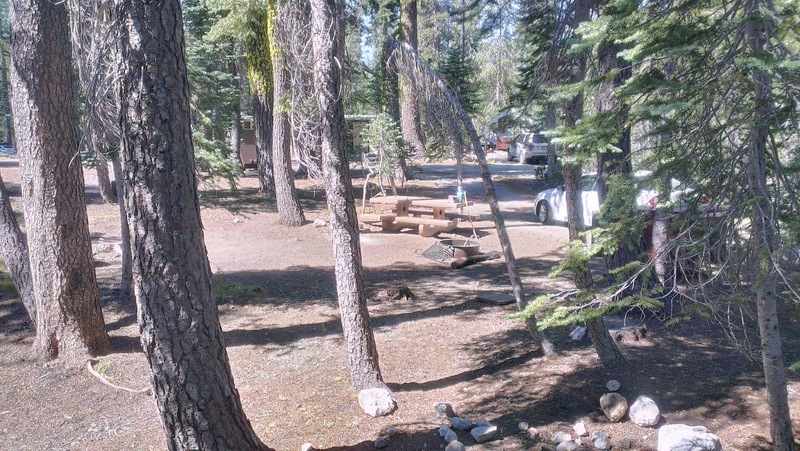 We've been on the road now for 15 nights; we've stayed in 4 motels, including one fashioned out of an old caboose; we've clocked up 6 campgrounds, from the freezing Lassen one at 7000 feet to this one at the contrived Calico ghost town which is like camping under a hair dryer. At a rough estimate, we've covered about 3000 miles, I think. We've seen, amongst other things, seals, dolphins, elephant seals, sea lions, pelicans, elk, deer, several thousand chipmunks and variations thereon, a snake, a bald eagle being picked on by a sea gull, several other birds of prey (I like to think of them as condors but they were likely vultures) and banana slugs. I came across a new bird I hadn't encountered before - the fetching blue and black Steller's jay, which I was quite taken with until its raucous call woke me up one too many times and then I read an info piece about how it kills and eats the young of other birds, being a corvid, particularly Murrelet chicks. I've swum in Lake Tahoe, paddled my feet in Emerald Lake at Lassen, waded and rafted in the Truckee river, splashed around in the Pacific and stood under a waterfall at Fern Canyon in Redwoods National Park. I've taken two coin operated showers and four very welcome showers at the motels, the most welcome of which was at the Caboose because it came after five nights of no-shower campsites, during which I resorted to boiling water over the stove and strip washing in the disabled toilet. Nice. When I got into the caboose shower I didn't get out for a good 20 minutes and I reckon they will have thrown away the wash cloth they provided, so grimy was it by the end. 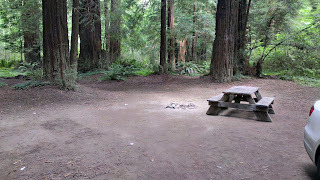 - "this isn't going to tickle" is code for "now you will discover what the back of your knee cap feels like"
We arrived at our last booked campsite, Prairie Elk in Redwoods State Park, at just about the same time as a large and tenacious thunderstorm. There was nobody at the visitors centre or at the check in, it being 7pm, and as we drove past the first seven sites on the loop - all on grass with no tree cover - I think we were both worrying about getting the tent up. 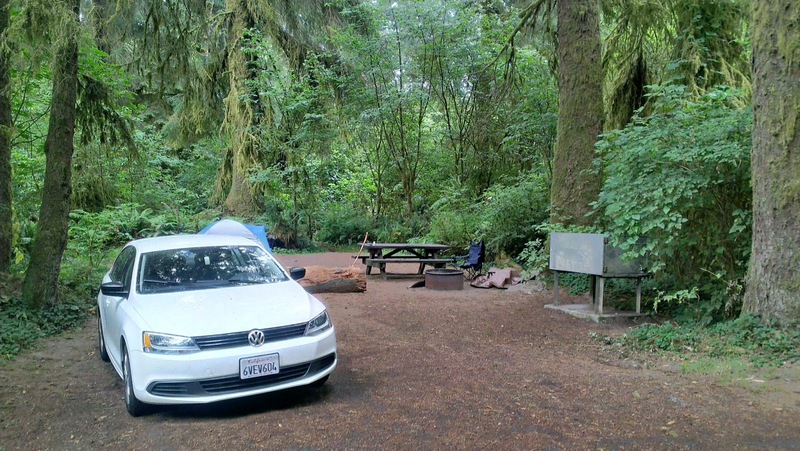 It turns out that the Zs can move swiftly when needed and we got the tent erected in record time, under a giant redwood tree which provided excellent cover. It was a bit of a blessing really because, as the rain persisted, the flattest part of our site became quite water logged since it didn't have the tree cover of the place we picked, and if we'd arrived in dry weather, I think we would have pitched there and been damper for it. Arriving under such conditions - heavy rain and swirling mist - leant the park a decidedly eerie air. The place is like a cooler version of the jungle in Malaysia: all enormous mossy trees, ferns and hanging vines. I keep expecting to see a storm trooper zoom around the corner, chasing an ewok. We managed to get some bundles of wood from the camp hosts, a couple of elderly ladies, who came past shortly later in a golf cart, peering at us from under ponchos and questioning whether we were holding rope (we weren't) since nothing should be tied in the trees (we had intended to). After I'd bought the fire wood, in my summer dress and flip flops, thanks to spending the previous night in a cosy caboose motel, an American approached wearing All The Clothes. Her: well, this is fun, but I'm kind of over it! All evening we've seen groups of Americans bundled up in rain gear. One girl even waved at us as she passed. "We survived the rain!" she called. Mr Z and I sniggered quietly. Rain? This isn't rain. Try 16 months solid and then talk to me. When we finally ventured up to the toilet block for teeth-cleaning, we realised the rain has actually stopped but it continued to sound long after, which I guess is the precipitation making its way down through the dense undergrowth. I read that the redwoods get one third of their moisture needs from the coastal fogs, but they certainly picked up quite a lot extra tonight. There's a creek running nearby too which adds to the watery music. It's all very relaxing. Between this and the rushing noise of the Truckee river at Silver Creek I am starting to think abut getting one of those white noise generators. 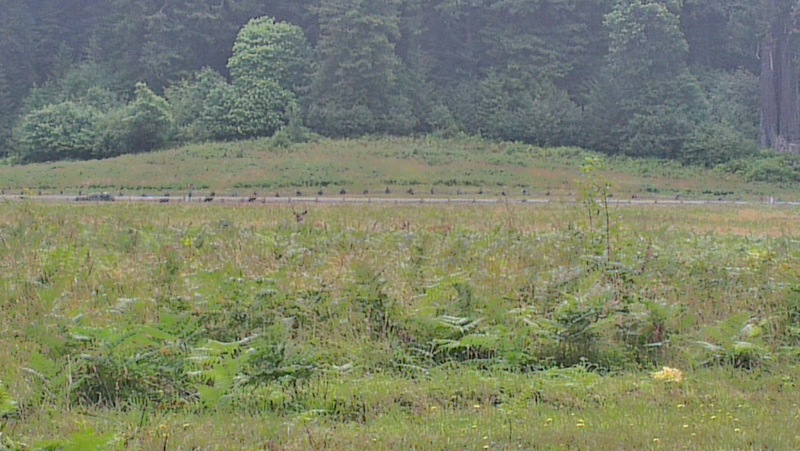 Look closely and you'll see the elk. They were pretty chilled out, wandering among these ferns. The lovely thing about returning to a place one has been before is the familiarity of it. You know where it is and how to get there; what amenities are around; little helpful tricks and tips that make things easier, and what the pitfalls are going to be; you know you like it, or why else go back? 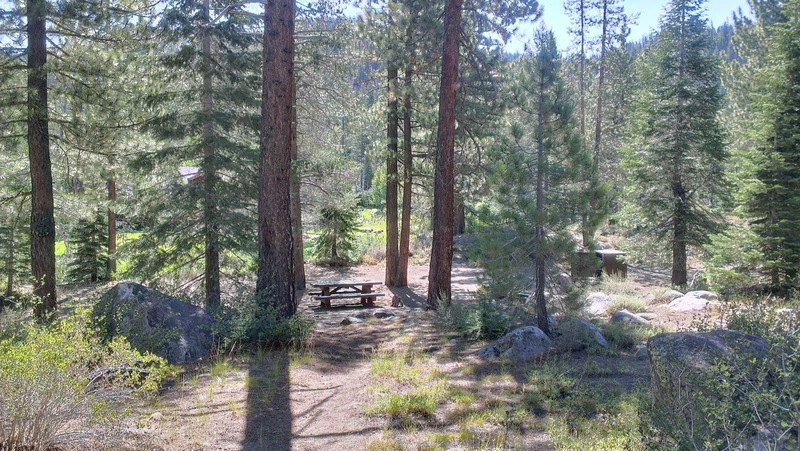 In our case, returning to site 22 on the Silver Creek campground, on the Truckee River, we have enjoyed immensely knowing what to expect. The walk from the car park is still just as far, but we knew about the private little beach that makes it worthwhile. There are still ants everywhere, but we know they drive away other insects and don't bite. Best of all, there have been two significant changes in the four years to the day since we were last here. Firstly, each site now has a large bear box - not only good for keeping away bears but also for storing all our camping stuff while we're off gallivanting. Secondly, there is now a camp host: an extremely affable gentleman with braces and a cap, who sells cords of wood so we don't need to go and haul back termite-infested felled trees from the Olympic park down the road. "Bears - yes," he said when we arrived, "though not as many as there used the be. The chipmunks carry the Plague, like they have for the past 30 years [we were alarmed, before leaving the UK, to read that some campsites around LA had been closed due to Plague-infested squirrels] but this year they also have the Hunter virus which is airborne and REALLY nasty, so don't encourage the chipmunks." He has been round a few times to check on us and have a chat, and it's really comforting to know there's someone looking out for this place. Today he told us about the recent yoga camp up the road, and how impossible it had been to check everyone in because they left at dawn and returned at midnight, and how he'd stood in the road to try and get them to sign in but they were in too much of a hurry to get to their dawn workouts. Yesterday he told us about the paperwork he'd had to do when a group of people never came back to break camp, and how their stuff is still in his trailer and nobody knows where they went. He's full of good stories. I think I would like to do his job one summer. A panorama from our "private beach". 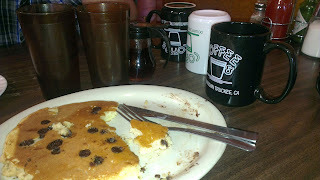 Today we've been into Reno - me, to visit the Mecca that is Jimmy Beans, Mr Z, to play golf at Rosewood Lakes golf course. He returned saying it was insane and one big water hazard; not exactly Rosewood Lakes but Rosewood Islands, with reeds and geese and water everywhere. He also said he'd like to do it again which is good, because it will make visiting Jimmy Beans that bit less painful for him. Since my last visit, the shop has moved over towards the airport. It's a modest size with a few skeins each of a good variety if yarn. But then, through the warehouse door...wow. Row upon row of boxes of yarn, all labelled and indexed and waiting for a customer like me to rummage through. I was in there a good 90 minutes before I surfaced, and my rummaging paid off because I found a skein of Artyarns beaded silk light which was my intended purchase but was listed as on back order until September on the website - and actually, was put through the till as a different colourway, presumably because of this. I'd love to say that was all that came home with me, but I can't, in good conscience. With all that Madelinetosh and Dream in Colour and Lorna's Laces and Malabrigo to choose from, I had to go back in for a second pass after the first rummage and a lot of justifying was done of the final total, chiefly that it is my birthday and that I did extra work in July for the exam board hat turned out to be surprisingly lucrative. I could so easily have bought more, but when will I have time to knit it up? And pretty yarn should become something beautiful. 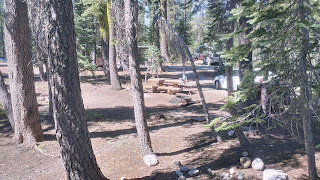 I'm typing this from campsite 58 at the DL Bliss State Park campground, Lake Tahoe. We've just grilled steak for dinner and packed everything into the bear box overnight and we're sitting by the fire under a million stars. Mr Z is wasting the torch batteries, shining it into the woods to check for bears. This is technically day 2 of the 2013 road trip, but it is our first night under canvas. We have a brand new blue and white tent which is a bit bigger than the old tent. That one had a broken pole from our last excursion in 2009 and we didn't want to chance it. It was cheaper to buy a new tent than it was to replace the poles, which felt a bit wasteful but I'm not complaining about the extra space. We had a bit of a mission buying it, because when we got it home and unpacked it to check, the instructions insisted that there should be two rain sheet poles but there was only one in the pack. So we drove back to the Bass Pro warehouse shop only to find that the others were the same. There was a lot of standing around and head scratching for a while until the manager came and suggested we go and look at the sample, which had been erected. Wise. From that, although it was put up wrong, we could see that one pole was indeed correct. Half an hour of head scratching for no reason. Yesterday we drove from Vegas to Lee Vining, in the Eastern Sierras, stopping for lunch in Beattie and to look round a ghost mining town called Palmetto. 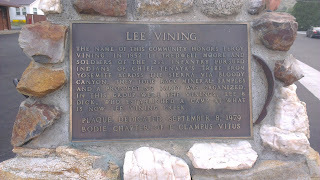 Lee Vining is a cute little town on the east side of Yosemite and we visited it last time during our ill fated stay at June Lake (where it snowed on my birthday and the tent was blown so hard by the wind the pole snapped - hence the aforementioned shopping trip). 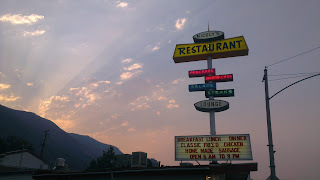 This time, since the journey was a long one, we stayed in a motel in the town itself. 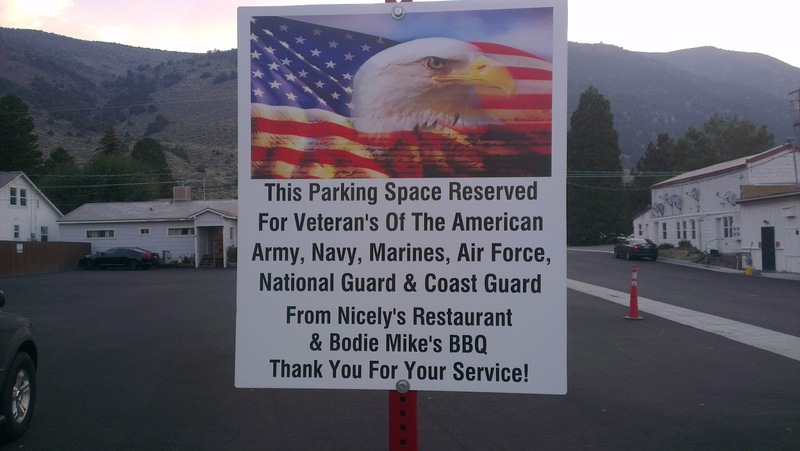 Excellent decision! I picked El Mono Motel - another excellent decision. 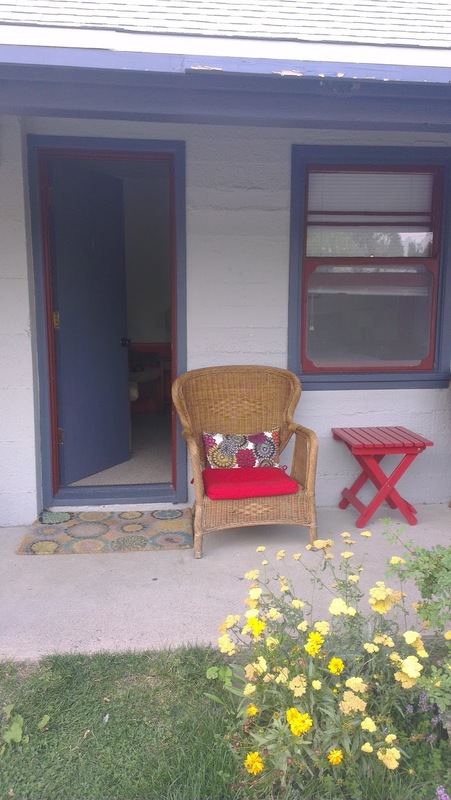 It is a motel in the true American style - a long row of rooms with cane chairs on the porch outside each one. There was also a flower garden and hummingbird feeders and a big fan and no air con (I can't imagine why it would be needed, it was not massively hot overnight and this is July) and a duvet on the bed and fresh baked cakes on the coffee shop. 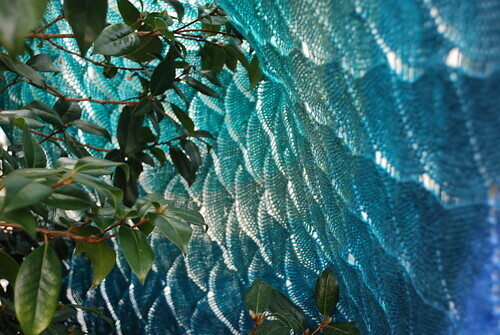 The bed was a big squishy affair and I woke up at 7 to hear the hummingbirds squabbling outside the window. Idyllic. We ate dinner on the verandah at Bodie Mike's Barbecue - home of "steak and ribs, burgers and things" - then went for a walk about town to gasp at the petrol prices ($1.50 more a gallon than in Vegas) and, after, sat on the porch knitting (me) and drinking beer (him) until bedtime. 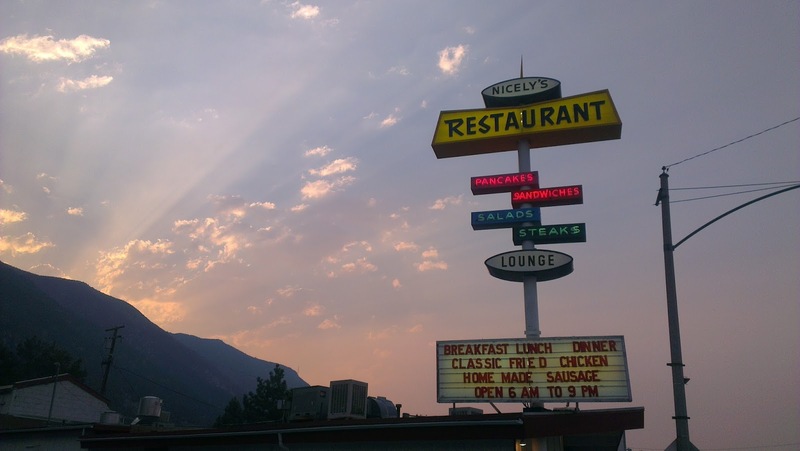 We had breakfast at Nicely's, where the Eggs Benedict comes with a side of pancakes. My only complaint is that the curio and gift shop no longer sells Hatley pyjamas: I bought my favourites, adorned with bears, here last time and was hoping to replace them. Then we drove here. It took longer than expected but we saw some very lovely things. I think my favourite bit was coming over the Sierras on Highway 89. We saw what seemed to be the world's most isolated cow shack (though, since we could see it from the road - albeit through binoculars - I'm guessing it probably isn't). 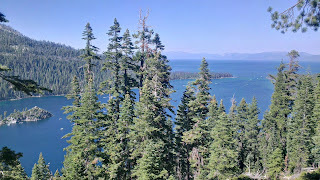 We took a wrong turn and saw a couple of good lakes to the southwest of Tahoe. 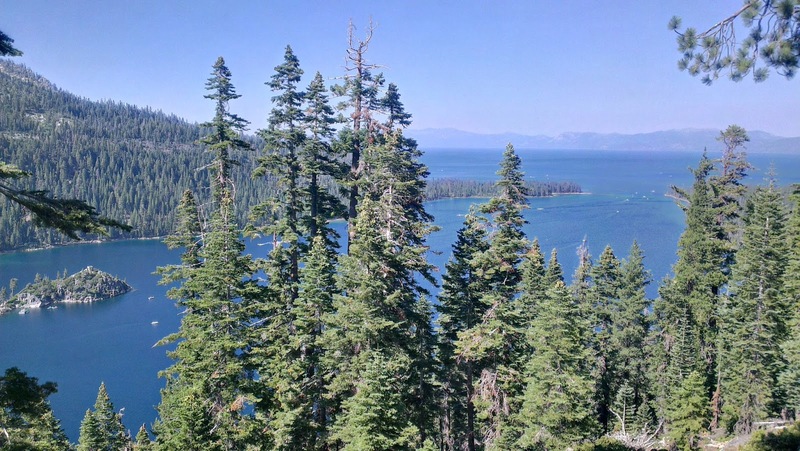 We stopped and admired Emerald Bay and the weird little tea room built on Tahoe's only island by an eccentric rich lady in the 1920s. We are returned! 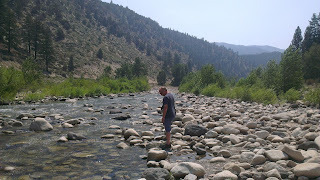 Mr Z and I spent three and a half weeks in the American south-west - four days in Vegas either side of an epic camping trip around the edges of California. I've tried to include everything on the map - the routes we took,the places we stayed, the restaurants we visited and the tour companies we used. It's really hard to say which the best bit was, because we saw such a diversity of things, but I think I would most like to go back to Lassen. It was like a mini Yellowstone and unfortunately they were doing road construction while we were there which limited what we were able to see, so I definitely feel like I have unfinished business there. 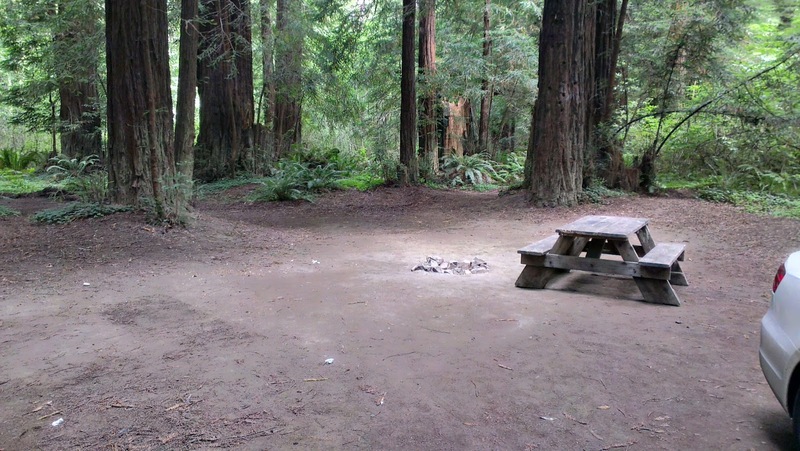 I have a series of blog posts about the trip which I wrote, mostly by the fire on the iPad while we were camping. I will post them in the order in which they were written and all with the same date, but I'll note the date of writing on each one.